It was very cold as I walked down the track under my load of photographic gear. More than half an hour before dawn, but the sunward sky was well lit, and the lights of the town in the distance were dying. Frost covered everything, and I could see the sheep's breath as they stirred, stretched and looked at me. I scanned the fields, trees and pylons with my binoculars, but there was no sign of birds. I had seen buzzards searching for earthworms this early before, but the icebound soil would let no worms through, and they probably knew it. 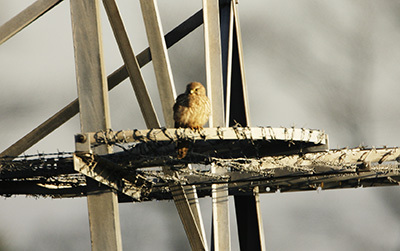 Where was the kestrel which hunted the slopes leading down to the river, the peregrine which used the electricity pylons to survey the patchwork of fields and hedges? Probably still in their night-time retreats, wherever they may be. 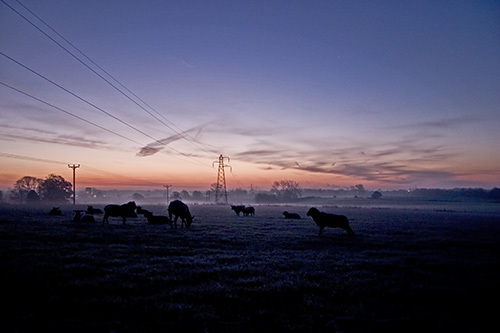 I set up my hide in the corner of the field containing the electricity pylon and waited, as the light grew stronger. A robin sang fitfully from the hedge for a while, and then I had a lovely close-up view of a wren, inspecting the hide from a yard away. A magpie stalked across the field, inspecting the sugarcane stalks, without finding anything to eat that I could see. 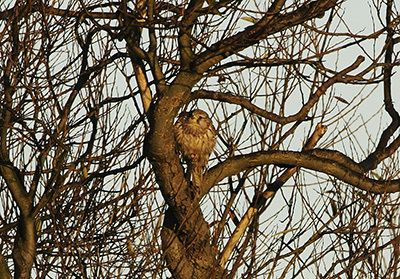 Then a bird flew across the field and landed in one of the hedgerow trees - kestrel! It sat there for a long time, staring at the ground here and there, and eventually flew to another tree. 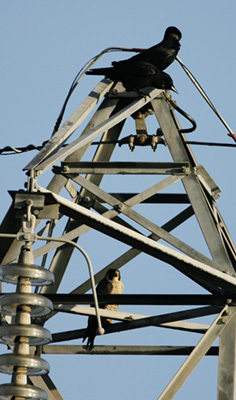 Suddenly, the kestrel flew off, and I saw the reason why when I looked at the top of the pylon - there stood a sleek peregrine, cleaning his bill and gazing around. For some time, he stood there, surveying the scene. Suddenly, he was not alone! 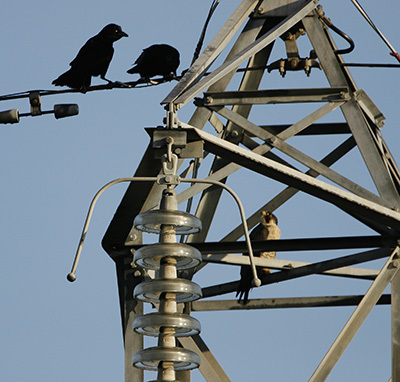 Two crows landed on the wire, then climbed onto the pylon, cawing menacingly at him all the time. 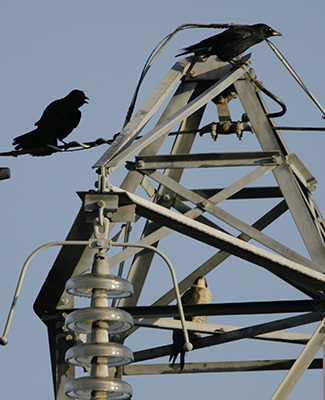 When they came too close, he yickered back at them but while they kept their distance, they were not at all abashed and remained on top of the pylon, cawing every now and then as if calling for reinforcements. Eventually, the peregrine flew off, pursued by the crows. 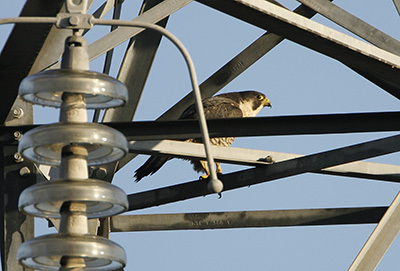 It was some time later that I spotted him again, on the top of the next pylon along, having shaken off the crows. 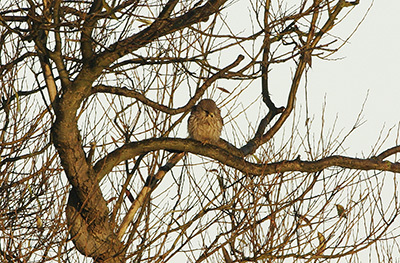 There he sat, a hidden menace, with a superb view over the fields and hedgerows. A few days later, as I walked down the track to the river, I saw a tremendous commotion in the air. All the birds that would normally be on the ground, earning their living from the farm's expanse of grass and the field of fodder beet that the cows were slowly working through, were in the air. They were flying frantically to and fro, starlings, fieldfares, finches, all in a panic. Gazing at the throng through my binoculars, I spotted the peregrine flying among them, making no attempt at a kill but flying around powerfully, seeming to enjoy causing the fuss. Maybe a bit like a customer in a supermarket, surveying all the Christmas food with great anticipation!